Democratic vice presidential nominee Tim Kaine commented Tuesday on CBS’ This Morning that he and Hillary Clinton were prepared to face the challenges that would come with the potential victory on Election Day. Speaking about how they could unite the country, he pointed out that the Democratic presidential candidate had served in the Senate working with Republicans whereas he had served as governor of Virginia, a job that implicated to join forces with two Republican-controlled Houses. Mr. Kaine told the Wall Street Journal in an interview that he would do his best to figure out the goals that lawmakers from both parties aim to achieve in order to be able to find common ground. He noted that legislators are in Congress to do much more than investigate and obstruct. Should he lose the election, Mr. Kaine said he would continue to serve in the Senate, according to The Wall Street Journal. Mrs. Clinton has served as first lady in the White House and as secretary of state and they both have strong relationships with local, state, congressional and Democratic Party officials since long ago. In Tuesday’s interview he remarked what they have done for the country and what they would do for it if they win. 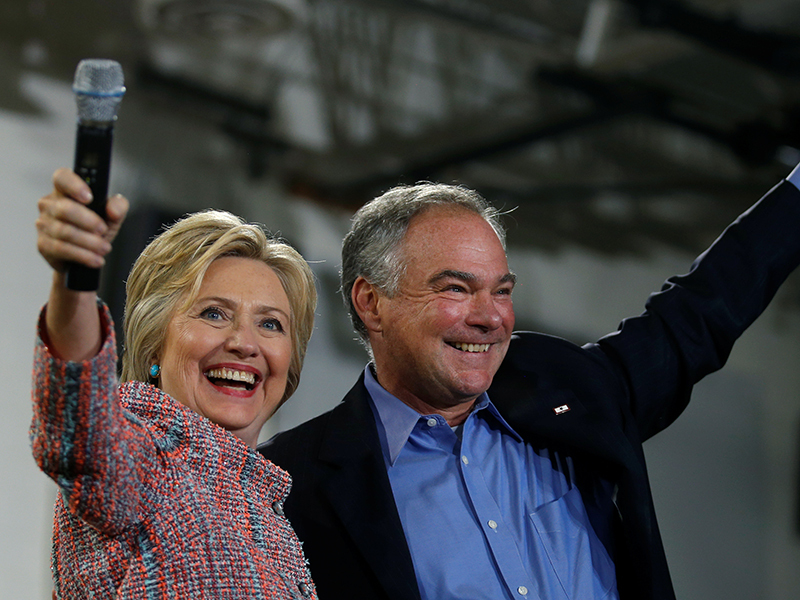 Kaine expressed his commitment to the improvement of the U.S. economy. Mrs. Clinton wants to put the economic and jobs package forward in Congress during the first 100 days of her administration and Mr. Kaine said he would first focus on that if elected, the Wall Street Journal reported. He would play a major role in shaping the policy, bringing “the stakeholders to the table and then sell it on the Hill”, he said. The plan implicates consulting mayors and governors across the nation. In terms of foreign policy, Kaine admitted that the Latino vote could play a big role on Election Day, particularly in some of the key states such as Florida, Virginia, North Carolina, Nevada, and Colorado. He said Latino voters understood the huge difference between Donald Trump’s wall idea and Clinton’s comprehension of the immigration reform. He added that it was “an empowering thing”. “But the other thing that’s really important, I think this is the election where the Latino community understands that they make a big difference, that they don’t view themselves as a minor part of the electorate anymore,” Kaine said, as quoted by the Wall Street Journal. Mr. Kaine would like to use his fluent Spanish to work hard on foreign policy. He wants to take advantage of his experience while working alongside missionaries in Honduras as a young man. Most secretaries of state, Mr. Kaine said, spend much more time flying east-west around the world and quote neglect the north-south stretch. He emphasized that he wants to take the opportunities the Americas have to offer by connecting with the 45 million Latinos who care about their home countries. As the 48th vice president of the United States, Kaine would find himself in a team of two presidents in the White House. Although he views that a “bonus”, he acknowledged that potential first spouse Bill Clinton and his wife would have to figure out their new roles if the Democratic Party obtains the majority of votes.